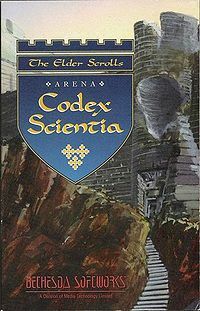 Codex Scientia is the official in-depth hint book for The Elder Scrolls: Arena, written by Judith Weiler and Ted Peterson, and published by Bethesda Softworks. It came with the Deluxe Edition of Arena, released in late 1994, and comes as a .PDF with the GOG.com version of the game. Codex Scientia is intended as a companion to the Arena Player's Guide, the game's instruction manual. The sections of the book are summarized below. The introduction gives the minimum and recommended system requirements to run Arena and special tips on the game's three main classes (mages, warriors, and thieves) and their respective subclasses, such as which attributes, equipment, and races are best to use. This section describes the dangers of exploring the wilderness outside the cities and provides tips on how to find random dungeons. This section expands on the player guide's bestiary, providing data on each monster's health points, attack moves, and suggested battle tactics. This section contains four sets of tables. The Table of Racial Starting Statistics lists each race's and gender's default starting attributes. The Character Class Level Advancement Table lists the experience points required for each class or sub-class to advance to the next level, up to level 20. The Bestiary Attributes Table lists the attributes of each monster. Finally, the Monster Hit-Point/Experience Point Table lists the damage, experience, health, and XP/HP of each monster. The section also contains a "Special note on Jagar Tharn", detailing his abilities, strengths, and weaknesses. This section contains maps for all fixed, quest-related dungeons. Each map indicates treasure, keys, quest items, and fixed monster encounters. Random monster encounters are excluded. This section provides the answers to every riddle the player may be faced with. This section lists every artifacts that can be found in Arena, along with their properties, where the quest to retrieve them can be started, and which classes can and can't use them. This section contains a copy of the Metal Types table from the player's guide, followed by general descriptions and lists of possible properties of Magic Weapons, Magic Armor, Marks, Crystals, Bracers & Rings, and Bracelets, Belts, Torcs & Amulets. The section ends with a list of all potion types and how to identify unmarked potions based on their description. This section contains various game percentages, including "Saving Throws" (evading or taking less damage from a specific type of attack), Stealing and Lock Picking, Combat Formula to Hit, and Chances of a Critical Hit. The final section of the Codex Scientia lists all diseases and their properties, and a "Holidays of the World of Tamriel" calendar. Under Artifacts and Their Attributes, the guide calls the Necromancer's Amulet the "Necromancer's Ring" and the Warlock's Ring the "Amulet of the Warlock", and claims that only one artifact can be possessed at any given time. This page was last modified on 2 October 2018, at 07:12.